Our grapes are back! We hope they make it through the summer for harvest. We had a lot of rain this year for January and February. Maybe this will make a nice difference. Cleaned up yard of trash from storms. Front yard in Lewisville took four and a half bags of red mulch and added some to the side. Spring is coming. Our annual flowers keep blooming. They are a happy sign for us. A friend gave me these about 7-8 years ago and they still look beautiful every spring. 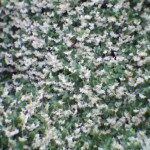 Here's how our lawn looks like this February. 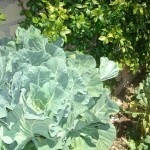 It has gotten much greener, because of the recent rains in December and January. It still has some patches of brown dirt. 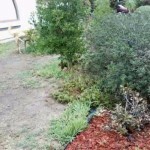 Hopefully, I can cultivate the lawn with some grass seed or patches of grass sod. Obviously, our drought has ended for this year. This is our orange tree. 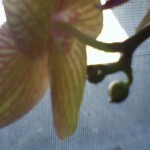 Fianlly, I have been watering a bit more, thus the fruit hasn't split down the middle. It also seems that the drought must definitely be over in Southern Califonria. 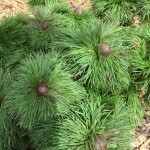 This has helped all of the struggling plants and grass. Actually, this whole week has been very rainy. Although our summer tomatoes are gone, this bush seems to have one last harvest! 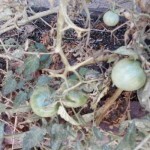 The tomatoes are green thus far, but I hope they ripen. I last counted 25 of them. We were so very happy with our grapes this year! They were sweet and tender, with a melt in your mouth skin. 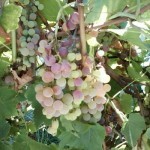 We will have to get used to store bought grapes again, until we try planting and harvesting grapes again. 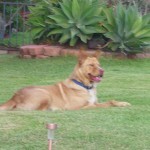 Red Dog is sitting on our green lawn. We are trying to get this lawn back to greener days after these few years of water rationing and drought in many Southern California cities. 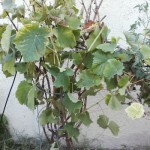 These grapes have been ready since mid July. We have been blessed this year with a great crop. 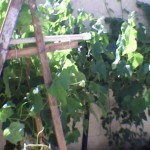 Here is the ladder my husband put in as a make-shift trellis to allow the grapes to have a wider span. (Also to not interude on the neighbor's fence.) Thus far, this seems to be working. This time of year, we are seeing our jasmine thrive! It smells wondeful, especially in the early evening. PLEASE HELP! I have taken this pic and an actual leaf to multiple garden centers. No one can give me an answer. I have noticed this past week that I have two more new orchid bulbs! This will be the third year these orchids keep producing. 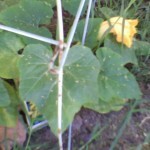 I am so happy to see the first flower growth on the crooked yellow squash. 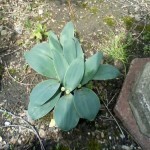 We bought the plant from a garden center about two weeks ago and planted it in our back yard garden. 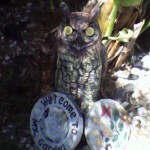 We added an owl to our garden entrance cicular sign blocks. 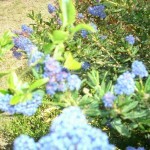 All these bees are buzzing around the tangerine tree, now that the lilac bush is close by-- swarming with bees. Could this help pollinate our tangerine tree? 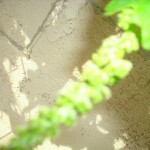 Our tiny grapes are progressing nicely. 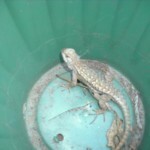 This is a cute picture of a lizard in our garden sunning himself in an empty pot. 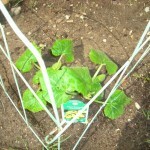 We planted this crooked neck squash this week. We hope that it yields a good crop with the recent onset of some rains.